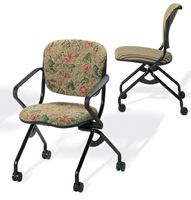 The Navigator has a sturdy four-leg design and articulating back. Provides a high degree of ergonomic comfort and allows users to fold up the seat and nest several chairs together. 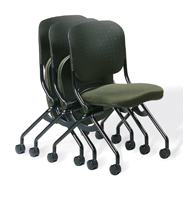 The navigator is a natural for conference or training rooms. Specify black or warm grey frames. Please see Fabric Samples page for vinyl or fabric choices.